Mork and Mindy was a 30 minute comedy series on ABC. Mork from Planet Ork is sent to Earth in his eggshell spacecraft to observe our culture and study our emotions since Orkans don't have any. He meets Mindy McConnell and she lets him stay in her attic. Mindy tries to keep the fact that her roommate is an alien a secret, but her Dad is not too happy about his little girl living with a guy, so Mindy has to explain! Everyone else thinks that Mork is just some guy who's one step away from a mental institution. You see, Orkans do many things the opposite of Earhlings. They sit on their heads, wear their shirts with buttons in the back, etc. Mork and Mindy was a "spin-off" of the 1974 series, "Happy Days". In episode #110 titled "My Favorite Orkan", Mork was sent to Earth to kidnap Ritchie Cunningham and take him back to Ork. The series was so popular that Robin Williams had his own series starting the very next season! By the way, his appearance on "Happy Days" was only his 2nd TV appearance. He had previously been on "Rowan & Martin's Laugh-In". Also, Mork and Mindy was the second spin-off of "Happy Days". "Laverne and Shirley" was the first. 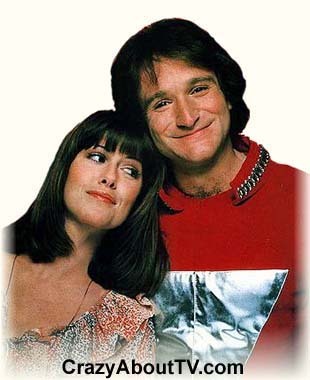 Mork and Mindy both appeared on the pilot episode of another Happy Days spin-off called "Out of the Blue". Mork visits his old friend "Random" (An Angel). During the series it's revealed that Ork and Heaven are near each other! "Out of the Blue" only lasted four months. In the second season, network executives decided that even though Mork and Mindy was a big hit, everything needed to be changed! They actually decided to do more serious and meaningful stories when the audience was simply loving Robin Williams silly slapstick humor! They also moved the show from Thursday to Sunday evenings. Look at your TV schedule ... you won't find many top-rated shows on Sundays, especially comedies. They also "got rid of" the entire supporting cast ... the very characters that audiences had just become accustomed to! Anyway, when ratings took a nose dive, they decided to change everything back for the third season. In the final season, Mork married Mindy, they honeymooned on Ork, got pregnant, and MORK gave birth to a perfectly healthy elderly man! Yes, on Ork the Males have the offspring and the "babies" are born old and age backwards to babyhood! Johnathon Winters played the role of a 225 pound baby to perfection! At the end of each Mork and Mindy episode, Ork would have to file a report with the Orkan leader named Orson. After making the report, he would twist his ears and say "Nanoo, Nanoo" which is Orkan for "Goodbye". Thank you for visiting our Mork and Mindy page!